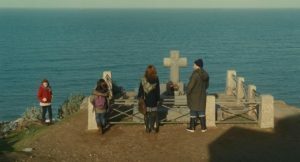 The French language title of Mia Hansen-Love’s perceptive new French film is “The Future”, but its English title is Things To Come. Both fit the film perfectly, but I think the English title goes further into probing the film’s meaning and the mindset of its protagonist. “The Future” is a fine and fitting title for this beautiful, understated domestic drama about a French philosophy teacher in her sixties who, over the course of a year or so, loses her marriage, her mother, and her general sense of stability. The film is very much about saying goodbye to one’s past, both distant and recent, and looking toward the future. However, “things to come” puts a word like “the future” under a magnifying glass, turning it over and unpacking for deeper layers of meaning. Even though we cannot see it, the future is something we all at least expect. A title like Things To Come, however, serves as a reminder that any person’s future is comprised of events that are entirely beyond our vision and beyond the realm of certainty. And so, Things To Come looks at the changes in the life of one fairly ordinary philosophy professor, given extraordinary depth by the great Isabelle Huppert, and uses that journey to explore how quickly assumptions about the days and years ahead of us can be thrown into flux. When we first meet Nathalie, the woman at the heart of Things To Come, she is riding a ferry with her husband, Heinz, and their two youngest children. 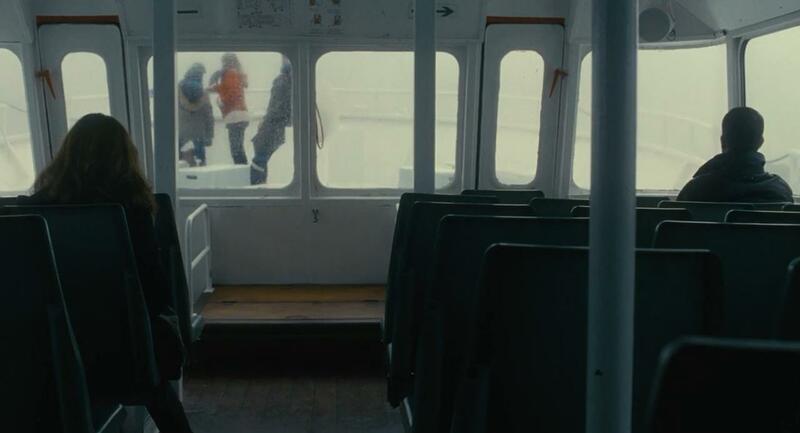 While the rest of the family converses on the front of the boat, Nathalie remains inside alone, reading through a book of philosophy. 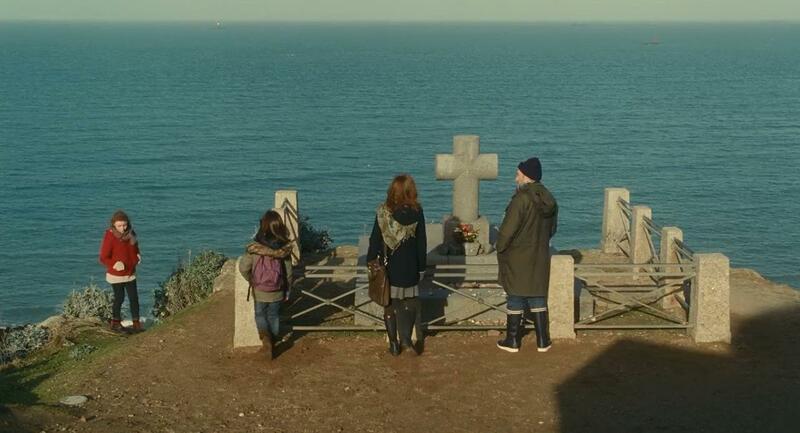 The family has gone to the French seaside to visit a famous writer’s grave, perched at the edge of a cliff. Both Nathalie and Heinz are writers and philosophy teachers at Paris high schools and it seems likely they have come to pay their respects to some important literary influence. After a moment at the grave, the children run off down the winding path and Nathalie turns to follow them. As she does so, Heinz asks to stay behind a moment. It may be a simple desire to reflect at the final resting place of an inspiring writer, but it could just as easily be an excuse for Heinz to buy himself a brief moment apart from Nathalie. When the film skips ahead three years, we will learn Heinz has been in an affair for quite some time. After the film revealed this pivotal piece of information, my thoughts went back to those first two scenes, depicting a marked distance between husband and wife. Was that moment of solitude at the grave the time when Heinz first contemplated seeing someone else, or had that relationship already started? How taken aback was he on the day he woke up and felt the desire to betray his wife of twenty-five years? Had he thought about it for months or did the temptation sneak up on him suddenly? How does a relationship change and eventually dissolve? Is it gradual, instantaneous, or some mixture of the two? I pose these questions not from a place of moral judgment of Heinz but more in the way Hansen-Love’s film does: out of a genuine, empathetic curiosity. The film is less interested in easy conclusions than in probing the mysteries of how people shift and evolve over time; how being in a relationship entails having to dance with a constantly changing mass of emotions, ideas, and flesh. And of course, you too are transforming away from what you have been and into, well, whatever is to become of you. Early in the film, we see Nathalie lecturing her students on the philosopher Rousseau. She reads them Rousseau’s thoughts on democracy, a form of governance that rests on the collective will of a teeming mass of people. Things To Come is about change, but it is also more pointedly about how change manifests through the erratic nature of human beings. Nathalie tells her students that Rousseau believed only a nation of gods could form a truly effective democracy, because humankind is too fickle. Human beings are inscrutable and unpredictable, and chaos arises from the fact that we must each build our lives upon the shifting sands of other people. Yet, while Nathalie is mindful of the unsteady nature of human beings, she also seems blissfully ignorant of the fact that this same philosophical principle she applies to human governance also applies to the smaller sphere of her marriage. Nonetheless, Nathalie’s next words to her students offer a reminder not to take human caprice too personally. “Don’t misinterpret,” she cautions her students, before reminding them that Rousseau was a firm believer in the social contract, meaning that he was never proposing we could do without each other. On the contrary, we must accept our fallible natures and still learn to make do with one another. At the end of the day, the chaos of human choice is simply a fact of life; a phenomenon no more deserving of condemnation than the wind or the tides. Outside of her teaching job, one of Nathalie’s constant tasks is looking in on her mother, Yvette, an elderly woman with early signs of dementia. Yvette has made part of her career on being a model, and still spends her time looking for work, even as her health steadily worsens. Yvette’s steady decline in cognizance is another reminder of how life is always moving and shifting, until it eventually escapes our very bodies. One morning, Yvette informs Nathalie that she is in consideration for a new role. She will be portraying a cadaver in a television show. In scenes like this, Things To Come reveals itself as a clear-eyed, mature, and unsparingly direct exploration of how relentlessly life moves forward. Nathalie’s beautiful, aging mother has spent her life doing a job that calls for her to sculpt imaginary realities, but there is a grain of truth in the fiction. At one time, Yvette was in her late twenties and one could have imagined her playing a college student or a young bride. In her forties, one could have perhaps seen her in the role of a middle-aged attorney or a professor. One day, she woke up to eighty years and a new reality: a casting director could imagine her as a dead body. Within the span of about a year, life will imitate art and she will no longer be alive. Change and the steady erosion of time are such pervasive forces that not even fiction can ignore them entirely. One of the film’s most stinging insights is that change can not only drastically alter our futures, but also rewrite our relationships with the past. After maintaining her composure for many weeks, Nathalie finally breaks down in tears while talking with an old student. The reason for her tears is not thinking about Heinz or his infidelity or the children she will see less often. Instead, she weeps from thinking about a place: Heinz’s family’s seaside home on the coast of Brittany. She recalls many summers spent there. It is the place where her children learned to swim and where she spent hours, days, and years carefully planting and nurturing a garden. It suddenly dawns on her that these spaces will be lost to her forever. Mere weeks ago, these places had a tangible connection to her present, because she could look forward to revisiting and touching them each summer. Now they will become the stuff of memory alone. Heinz feebly tells her that she can still visit any time she wishes, even when he is not there, but she tartly rebukes him. “You keep acting like everything is the same,” she spits out in exasperation. “What planet are you on?” Of course it is physically possible for Nathalie to return to her ex-husband’s summer home, just as it is physically possible to go back to the halls of your old high school, or to travel back to your favorite restaurant in the town where you lived when you were twenty-three. The physical possibility is not the issue. For Nathalie, the context has all evaporated. The dissolution of her marriage is such a powerful event that it has radically altered the very essence of a physical space. Brittany still exists on a map of France, but it will never be the same. Now, perhaps this all sounds like a depressive wallow at best, or a tedious essay at worst. A pensive examination of how change and upheaval affect an aging French divorcee could have easily been relentlessly dour or unbearably dry in the wrong hands. 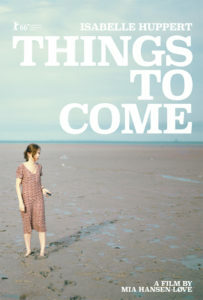 But, somehow Things To Come manages to be a terrifically involving and engaging study about living and adapting. It becomes a lovely and lively character study, while always remaining understated in its observations. It’s actually quite a feat of thoughtful, low-key filmmaking, and there is really no doubt about who makes it possible. 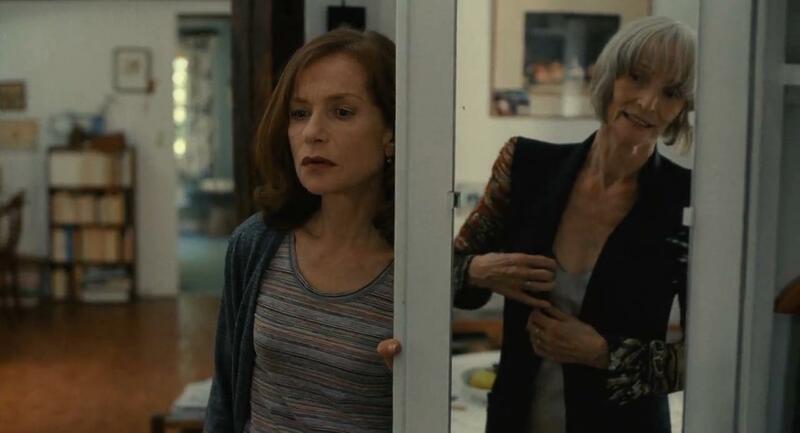 With all due credit to a subtle, terrific cast of French actors in smaller roles, the film belongs entirely to the two women in charge: Isabelle Huppert, finding the nexus between subtlety and jazzy spontaneity in front of the camera, and Mia Hansen-Love sympathizing and commiserating with her as a director. Huppert is one of our greatest living actresses and she accomplishes the seemingly impossible trick of making a reserved, contemplative woman’s late-life crisis feel dynamic and even funny. Hansen-Love mostly sits back and trusts Huppert to breathe uninhibited life into this very simple narrative, but that is not to say that there is anything passive or lazy about her directorial approach or her wise, delicate screenplay. She just has the courage and the cool confidence not to manufacture needless melodrama. As a result, Nathalie’s journey is somehow both emotionally rich and refreshingly unsentimental. Hansen-Love knows how to tease out the themes of her story in small details. Take for example Nathalie’s profession as a philosophy teacher. That character trait is not merely there so Hansen-Love can fill her film with bits of Rousseau and other deep thinkers. Nathalie’s philosophical hunger is key to the character and her arc, because it ends up being the compass that sees her through. It is as important to Things To Come that Nathalie is a philosopher as it is to Happy Go Lucky that Poppy is an optimist. It is a film about life’s trials as experienced by that specific type of person. Having the inquisitive spirit of a philosopher enables Nathalie to take a removed and curious view of her own misfortune and about the uncertainty of what is to come. That is why Things To Come can look without blinking at some pretty miserable circumstances, like betrayal, divorce and the loss of a parent, and never really feel miserable. Nathalie is by turns apprehensive, fearful, and frustrated, but she is simply too vivacious and present to ever succumb to despair. In one of the film’s most famous shots, the two current tragedies in Nathalie’s life team up to knock her for a loop. As she rides the bus home from her mother’s funeral, she looks out the window and sees Heinz walking blithely down the street with his new, young girlfriend. At that moment, she stops sobbing for her departed mother and laughs in disbelief. The puckishness of this timing is too cruel to be believed and also too bleakly absurd not to be just a little funny. Life can be merciless. How curious. In Huppert’s hands, both Nathalie and Things To Come dance along a tightrope between sorrowful pragmatism and zesty curiosity for what it means to live, love, and one day die. In one of her most depressed moments, Nathalie tells her old student that she will never again know romance and that a single women her age is marked for the trash heap. A few minutes later, however, she quickly brushes her woes aside. “It’s not that serious,” she reminds her student and herself. “My life isn’t over.” This is the essence of the film and the character; intrigued and at times overwhelmed by emotion, and by the knowledge that every single thing we know and experience will one day end, yet never surrendering to fatalism. Death is a part of Things To Come, but Things To Come is not a film about death. It is a story about putting a hand across one’s brow and peering out toward all that will transpire between this most recent, passing moment and the eventual conclusion of it all. I believe Huppert and Hansen-Love want us to take heart and inspiration from Nathalie. To allow ourselves to feel sadness, or whatever emotion strikes us, for the departed past, while still looking to the horizon with curiosity and some guarded measure of hope. That seems worth striving for, in 2017 or any other time. I would go too far to call Things To Come an optimistic film, but its voice is warm, soothing and composed. We should do our best to keep moving forward while we are alive and we should learn to find some mixture of excitement and edification in the fact that nothing in life ever truly stops changing. “Death and taxes”, Nathalie might say, before taking out a red marker and crossing out “taxes”.